Home / Worth writing about… / All / September 2010 meeting: new project, new venue! September 2010 meeting: new project, new venue! 20 Aug September 2010 meeting: new project, new venue! As part of our ongoing commitment to exposing social injustice, the Collective will be contributing to Norwegian artist Lise Bjørne Linnert’s current project, entitled DESCONOCIDA UNKNOWN UKJENT. The project uses the art of embroidery to highlight and protest against human trafficking and femicide, specifically in the city of Ciudad Juarez on the Mexican border. Since 1993, 800 women have been brutally murdered in Ciudad Juarez and hundreds more have gone cheap online pharmacy uk missing, while the Mexican government turns a blind eye. Prostitution in the region has increased 400% in the same time period. 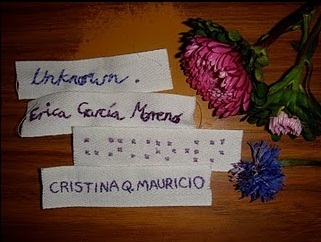 We will be embroidering the name of one murdered woman on each label alongside the word “unknown”, in remembrance of the hundreds of unidentified victims of similar crimes worldwide. The project is a mass act of solidarity. So far, 2100 individuals in 27 countries have embroidered more than 4000 labels. The Craftivist Collective will add to that figure and help to spread awareness of these atrocities. An installation of the labels will be on show at PALLANT HOUSE GALLERY in Chichester in October 2010. If you would like to obtain labels to make your own contribution, contact Pallant House directly.